Every once and a while, the team at WDG gets to work not once, but twice, with incredibly stellar organizations. Each client partnership we stumble upon has the potential for growth and connection, and there was no better example than Excelencia in Education. Excelencia in Education was brainchild of Deborah Santiago and Sarita Brown, who, before its conception in 2004, were the Deputy Director and Director at the White House Commission for Educational Excellence for Hispanic Americans collaborating on ways to further promote policy changes to help the Latino student community succeed in higher education. In 2013, Excelencia approached WDG for a complete platform upgrade and content migration to a new Drupal-based website. (For more details, take a look at the Excelencia in Education case study.) After a particularly successful collaboration, Excelencia employed WDG’s help for a new, dynamic concept that would help give back to the communities they work to serve: HSI-CP2. The launch of the Hispanic-Serving Institutions Center for Policy & Practice—or HSI-CP2—marks a great innovation in the advancement of Latino students into universities across the United States. 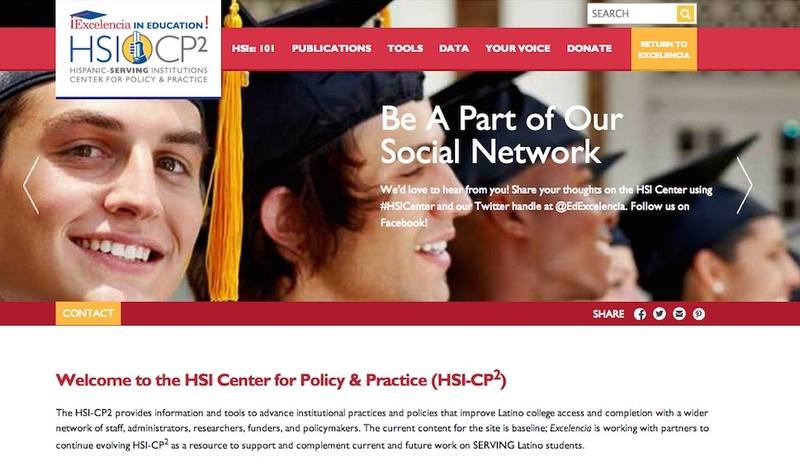 A concept that was 20 years in the making, HSI-CP2 is the first data repository of Hispanic-Serving Institutions for researchers, education institutions, and policymakers alike. HSI-CP2 provides these audiences a range of resources and tools to inform policy discussions on emerging and current HSIs, organize a central location where people can learn from reputable sources, and help policymakers make decisions “that are the best ones, not only for Latino students, but for all students,” Michelle explained. “The students that graduate are going to be a strong part of our workforce,” she continued to say. “[The HSI-CP2 website] is a way people can find information and bring those resources to where they are,” whether they are educators or legislators. Among their many upcoming projects is an interactive forum—that WDG has already created in the site’s backend—where users can communicate about what kind of information they want to exist on Excelencia’s website and what tools would be helpful. Excelencia’s organizational growth is interconnected with the growth of its online presence, Michelle said. As they continue to contribute more resources and tools onto their upgraded digital avenues, Deborah’s and Sarita’s 10-year-old mission will be able to reach even more audiences, all in the hope of accelerating Latino student success in higher education. Interested to see what latest projects WDG has completed? Take a look at our extensive portfolio to see what our designers and developers are all about.